For a fascinating overview of caves and caving in Mexico, see John Pint’s great article and image gallery (link below) on MexConnect. Pint is an accomplished caver and author who has explored caves on several continents. His writing is clear and authoritative, much of it based on his own first-hand experiences and investigations. Caves have played an important part in Mexico’s history. The Maya on Mexico’s Yucatán Peninsula, which is largely limestone, and now known to be riddled by amazing interconnected sinkholes and subterranean tunnels, viewed caves as entrances to an underworld. They revered some caves in particular, adorning them with lavish offerings. The sinkholes of the Yucatán Peninsula are beautiful, but are not all that deep. In the state of Tamaulipas, El Zacatón is a sinkhole that is considered the deepest water-filled sinkhole in the world. Mexico has the deepest water-filled sinkhole in the world. In recent years, scientists have begun to unravel the mysteries of how strange forms of life can thrive deep underground, even in environments that are noxious to humans. 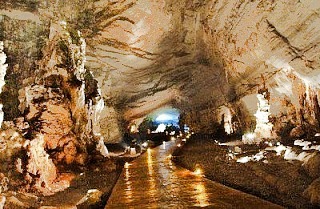 The sulfur-loving organisms of the Cueva de la Villa Luz in the state of Tabasco are a much-studied example. Pint also discusses lava caves, of which Mexico has some fine examples. One of the most visited lava caves in the world must be that which plays home to the La Gruta restaurant, close to the famous archaeological site of Teotihuacan. And, finally, for one of the most spectacular caves imaginable, how about the Naica crystal caves? Visit John Pint’s website for a selection of his writing, with many original articles, illustrated with great photographs, about individual caves in Mexico. Feedback from readers about any aspect of Geo-Mexico: the geography and dynamics of modern Mexico is welcomed. Recent news briefs related to the geography of Mexico City Mexico City’s pink taxis: are they a good idea?